Peter Scott is Chairman of the Baker Heart & Diabetes Institute and Deputy Chairman of Gresham Partners, Australia’s largest independent investment banking firm. He has more than 30 years’ experience in providing financial advice to large Australian companies and governments. 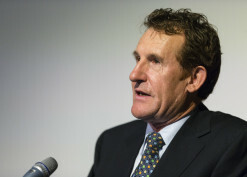 Mr Scott was a member of the Australian Takeovers Panel from 2002 to 2014, and a member of the New Zealand Takeovers Panel from 2008 to 2014. Mr Scott was also Chairman of the Medical Research Future Fund Action Group, of which AAMRI was a founding member, in the campaign that led to the MRFF’s establishment.